The Everysight Raptor is a pair of AR smartglasses built for cyclists and triathletes that's packed to the brim with features. The startup behind them is an offshoot of Israeli tech company Elbit, which makes helmet-mounted displays for the military and civilians. It's been working on augmented reality smartglasses for more than a decade, and the Raptor represents its first foray into making something for the masses. Essentially packing an Android smartphone into a pair of glasses, these specs have the ability to display cycling data like cadence, distance and power in front of your eyes. There's built-in GPS to map routes and navigation support to help you get to your next destination. It's even made room for onboard speakers and a camera to shoot footage from your rides. At $649 for the 32GB version or $699 for the 64GB version, it's priced at about the same as a smartphone too, so it's by no means an impulse purchase. But if you're seriously into your cycling, and you like the idea of not staring down at your bike computer or watch, it's clear the Raptor will have appeal. We've been out riding with the AR cycling smartglasses for a few weeks now to see if you need these specs in your life. Here's our full verdict. Everysight is offering these glasses in two different colours. You've got your pick of electric green or stealth black. We had the latter, which keeps things pretty slick and minimal in the looks department. Out of the box the first thing you'll notice though is the weight of these glasses. Your regular cycling sunnies will feel featherlight in comparison. Packing all that tech into the glasses has come at the expense of lightness. They weigh 98g, and during a two-hour ride wearing them that extra weight showed, specifically as they began to rub on the bridge of my nose. Fortunately, the nose arc bridge adaptor that comes with it is adjustable, and after fiddling around it was more comfortable to wear for those longer rides. While the Raptor appears bulkier than other sunglasses, you don’t actually notice that bulk once they are on. They feel secure and aerodynamic, and we had no problems with fogging during riding. They fit flush to your forehead and the arms grip tightly but not too tightly. The visor is interchangeable too with light and dark options available for an added price if you want to mix those looks up. Controlling the Raptor requires a little practice but doesn’t take long before it becomes second nature. You swipe your finger along the right-hand arm to cycle through the screens on the heads-up display, tapping once to make a selection, or twice to enter camera mode. You can also purchase an additional remote control that connects to the Raptor, so you can operate it from your handlebars without taking your hands off the bars. The Raptor takes its location information from GPS, which can cause problems as it can be quite slow to find the signal. However, once connected there were no issues with it losing the signal. Additionally, if it is struggling to connect, or the battery on the Raptor is low, you can run it through your phone’s GPS. Connecting sensors is relatively straightforward too. Power meters, speed/cadence sensors, heart rate monitor and the Raptor controller can all be paired via the ‘Add sensor’ selection. It also pairs with both Bluetooth and ANT+ devices giving you plenty of scope to match it up with your existing kit. The heads-up display is the headline feature of the Raptor and the way you'll be able to look at your real-time data right in front of you. Everysight employs its own BEAM technology, a OLED-based projector system that beams the display right onto the inside of the lenses. So there's nothing in between your eyes and the regular sunglasses lens on the Raptor. It provides a display that's equal to a 65-inch screen size offering a virtual viewing distance of 12 feet. The first time you put the glasses on you will be prompted to adjust the screen so you can see the display as clearly as possible. You can re-adjust this via the app if you need to tweak it later on. The display is projected slightly ahead of you, which is slightly disconcerting at first. However, you soon get used to it, and can focus in and out of seeing the data as and when you need to while riding. That projection is high quality, offers strong visibility and is never distracting. It does a very good job of helping you keep your eyes on the road, but still serving up that insightful data. There are five screens in total you can swipe through, each showing a variation on the data being recorded, including current speed, elevation, heart rate, cadence, power and average power and calories burned. These screens are fully customisable, so you can add whichever data you want to see on each screen. You can also programme the Raptor glasses to update you on these stats regularly through the speaker as you ride. The speakers are built into the sunglasses’ arms, so there are no earplugs required. That means you can safely hear your surroundings as well as messages from the Raptor. You can also transfer music to your Raptor and play it during rides without blocking out background noise. It's not just your cycling stats that are catered for here. It does also display your emails, texts and calendar appointments as notifications on the display when paired to your phone. The notifications are well optimised for the display and, like your cycling metrics, crucially won't obstruct your view of what's ahead. Voice control is a handy feature – simply say ‘Go Everysight’ and then ‘Take picture’ and it will snap a shot while you’re riding without you having to lift a finger. The voice control worked smoothly during our testing, even on windy days when commands could appear muffled, and was a welcome addition to the experience. The built-in 13.2-megapixel HD camera is capable of shooting video at 480p/30fps, 720p/60fps or 1080p/30fps. The 480p quality option is the recommended setting if you want to share the road rage encounter you captured on film on social media. As mentioned, there are 16GB and 32GB models of the Raptor if you want more storage to play with for your footage. Videos can currently only be recorded for 60 seconds though, in an effort to preserve battery life. The footage is overlaid with the onscreen data as you can see from the video above. No doubt this will prove a popular feature for riders who want to claim speed bragging rights on white-knuckle descents, or even wattage during lung-destroying climbs. An interesting feature is the option to download workouts and use the Raptor to guide you through the workout on the roads or trails. The Everysight website has a bank of workouts you can access. These workouts are similar to the kind you’d see on TrainerRoad (there are even FTP tests), and vary in time and intensity. Once downloaded onto your unit you will see an arc needle pointing at your desired metric, so you know whether or not you need to push harder. You can choose to train via power, cadence, speed or heart rate. When you've finished your ride or workout, simply save your ride and your Everysight data will automatically sync with any other fitness apps such as Strava. Data from the Raptor is fairly basic, so Strava will help beef up your metrics following the ride. The workout feature was a surprisingly useful addition to the Raptor, and works in a similar way to Oakley's Radar Pace glasses in that they can transform a simple ride into a structured training ride. Except, rather than someone telling you what to do in your ear, you're being told to hit a certain power output, heart rate or cadence. It makes for an innovative way to train while on your bike and not on a turbo. To make full use of this, as with a turbo, you will need to invest in a power meter. The Everysight app is available for free on iOS and Android and is used to download ride data and media from your ride, and upload routes you might want to follow (GPX or TCX files) or workouts that you want to attempt to complete on your ride. You will need to download the app for initial pairing and when using routes or workouts you have uploaded from your Everysight account. The app in general features a simple layout with clear sections, and is straightforward to use, with it clearly showing you whether your rides have been transferred from the app to the Raptors and vice versa. Downloading media from the Raptors to the app was quick and painless, and once they're in the app on your phone you can easily add them to your photo library and upload them to social media (it would be handy if they synced automatically post-ride). The only negative is a lack of elevation data and calories burned on the ride data, but this can be calculated on Strava. Battery life for the Raptors is eight hours, but from testing, that seems a little optimistic. To reach that you’d most likely need to run the Raptors’ GPS off your phone rather than the sunglasses themselves and not take any photos or video. On a two-hour ride the battery life was down to 50%, so a more realistic estimation would be around four hours based on our experience. 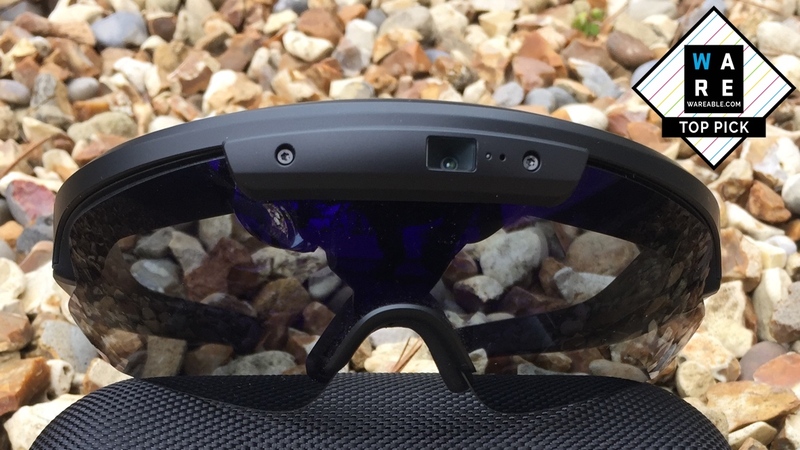 In terms of cutting-edge tech, the Raptor has it all: the heads-up display is a revelation and is without doubt the future of sports sunglasses. They are easy to use and the voice controls are helpful while riding. The fledgling AI means you are paying for new technology, but if you are a serious cyclist these are well worth the investment.